Grab a bowl, some hot (not boiling) water, a pinch of Oxyclean and have a soft bristle toothbrush at the ready! Place your ring in the mixture of Oxyclean and water and proceed to WAIT for 10-15 minutes. Let those bubbles go to work! Don't be alarmed! There might be some funky stuff floating around in your Oxyclean bath - all that mystery gunk has been loosened up and now needs to be scrubbed and rinsed out. Grab that SOFT bristle toothbrush and with the faucet running give the open space behind your stone a good old scrub. Rinse and scrub until it looks as though your ring has been officially de-gunked. Step 4: Dry that Puppy off and be AMAZED! That's it! 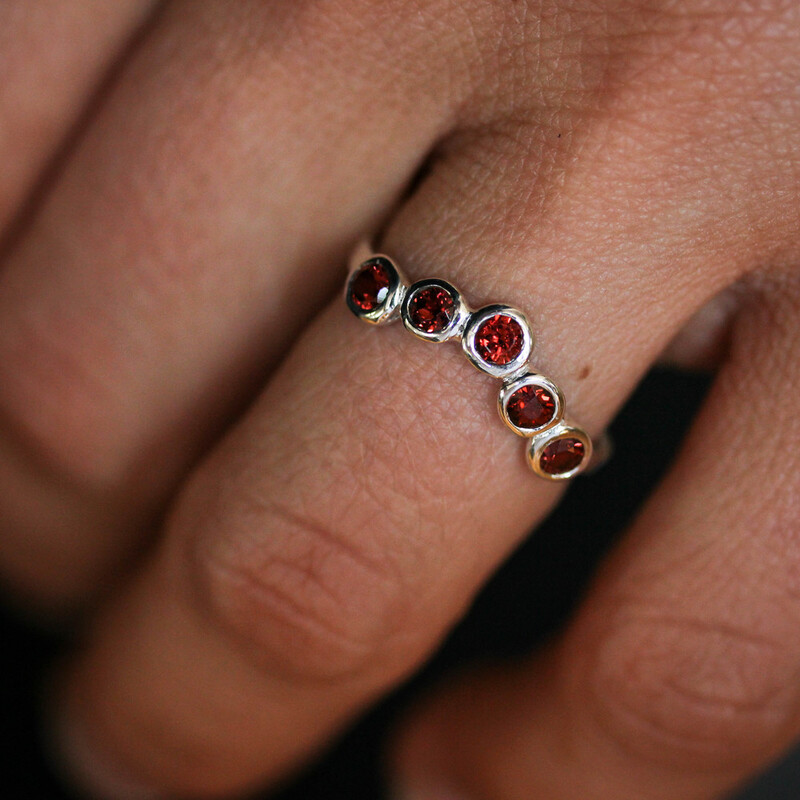 A simple soak and a gentle scrub can keep your ring looking stellar all the time. In order to minimize the amount of debris that can build up behind the stone take your rings off when applying hand lotion and rinse behind the stone every time you wash your hands. But, when the time comes this simple at home trick can remove more of the stubborn gunk that can take up residency behind your bezel. We are always thrilled and honored to see beautiful moments shared by our customers. This wonderfully light and color filled wedding made our jaws drop with joy. We were lucky enough to make all three rings for this beautiful couple including her engagement ring, and both wedding bands. Best of luck as they move through the future! Inspired? Get some more ideas from this gorgeous wedding at Green Wedding Shoes. Madelynn Cassin Designs - Seen here: 14k Yellow Gold Hand Carved Chevron Band available here. 14k Rose Gold and Morganite 8x8mm Cushion Cut Stone available here. Sterling Silver Men's Slate Band available here. This One of a Kind Green Tourmaline and 14k Yellow Gold Ring is available for sale here Ready to Ship in a Size 6. Along with Opal - Tourmaline is used as the October birthstone. Here are a few facts about Tourmaline from our favorite source on Gemstone info the GIA Encyclopedia. For more Facts about Tourmaline check out more from the article above from the GIA Encyclopedia. Our Newest addition to our collection of hand carved Chevron inspired bands. These thin bands measuring about 1.5mm wide can be worn alone, alongside an engagement ring or stacked together as a statement. 14k Yellow Gold and 14k Rose Gold are available for purchase here for 14k Palladium White Gold, please send us a message here. For rings that are going to experience long term daily wear, such as an engagement ring, we always recommend a hard stone to go with a more durable metal such as 14k Gold. For great facts about all kinds of gemstones, including our favorites, check out GIA's Gem Encyclopedia. Does your piece lack the luster it once had? Stone look a little cloudy? Even have some interesting gunk building up under that bezel? Fear not! Here are a few quick and easy steps to return that sparkle in your favorite piece! 1. Keep Those Hands Clean - Every time you wash your hands, take a minute to rinse the back side of your ring (underneath the bezel) this will help to prevent any gunk from starting to build up and cloud your stone. 2. Need a deeper Clean? Grab your ring, some hot water, and a pinch of Oxyclean. Place your ring in the solution of Oxyclean and hot water for a 15 minutes, this will help to dissolve any built up skin cells, lotion, hand soap and any other things that make be hiding behind your stone! After the 15 minutes is up take a SOFT bristle toothbrush and give the area behind the stone a good scrub, this will help to remove the dissolved debris. Rinse under the faucet and BAM! Look at that puppy sparkle!